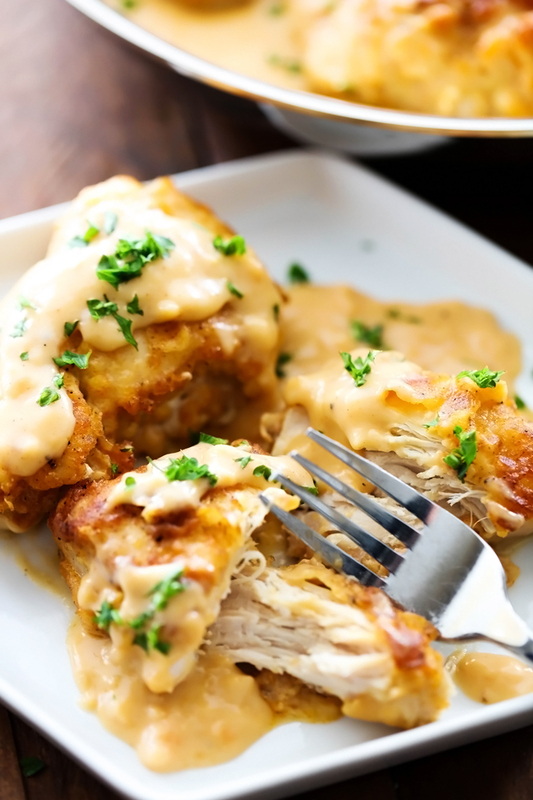 This Chicken Paprika is an amazingly flavorful chicken recipe that is coated in an incredible batter and has an unbelievably delicious gravy. This will be one meal you will want to eat again and again! Growing up, we had quite a few dinner staples in my home. My mom is such a talented cook and actually created nearly every recipe she ever made while I was living with her. This Chicken Paprika happened to be one of my absolute favorites of hers and for good reason. This meal is special for so many reasons. It begins with pan seared battered chicken that is then baked cooked to perfection. 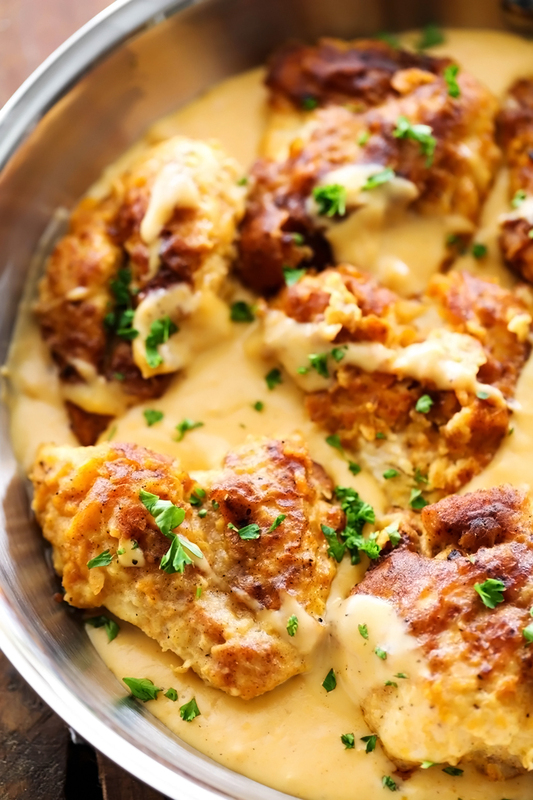 The gravy, though, is what completely blows this dish out of the water! I am not joking when I say this entire recipe is spectacular. This dinner has such an incredible flavor that is sure to become a new family favorite! Add ½ cup flour mixture you used to coat your chicken in to the melted butter. Cook for 1 minute. Slowly add the milk and stir quickly using a flat wire whisk until smooth. Add the crushed chicken bouillon and salt. Stir until gravy comes to a soft boil and thickens. This looks amazing. I'll definitely try out out! The only thing I'll do is save our the flour mixture before dredging the chicken. I know you cook it, but still. That's just me. I also will probably throw in some chopped mushrooms. I think it would pair perfectly with the chicken and gravy. Yum! So I did make this. I pounded the chicken flat to help it cook faster and be crisper. It fully cooked in the pan, I just kept it warm in the oven while making the gravy. With the gravy I sauteed mushrooms in the butter before adding the flour. They were delicious! This whole meal was very yummy. I liked the mix and balance of spices. Definitely will make again! Spicy! And looks really yummy! This sounds really good! I'm just wondering if the coating gets soft when it's baked covered? We actually didn't cover ours, and it was perfect! Having this for lunch today and can't wait for my lunch hour! Thanks for the amazing and easy recipe! Sounds very delicious. Will definition give it a try, maybe even tomorrow. When you say 1/2 cup flour mixture do you mean just flour? Do you think I could use smoked paprika? I LOVE smoked paprika. Do you use bone in or boneless chicken breasts? I would cut the amount of paprika in half. My family would love it. Do you think this would freeze okay? Putting the chicken together, then flash freezing and either packaging the ingredients for the gravy separately, or making the gravy and just heating up? This sounds delicious! Definitely going to try it out soon. Could u opt out on the cyanne pepper? Don't like spicy?? Can use coconut milk, chicken broth, Greek yogurt? I made this last night for my family, and it was so good. I followed to recipe exactly, and it was perfect! This was a total waste of time and money!! The chicken was sort of bland and soggy. The only word for the gravy was awful!! My husband will usually eat anything that I make. He tried 1 bite and put the lid back on and walked away!! Made this with bone-in chicken thighs and legs and it was delicious! The recipe is flavorful, NOT spicy. The gravy does take a while to thicken, so, do start making it as soon as the chicken is in oven. I will certainly be making this again for sure. Thanks for sharing! Definitely an indulgence, but SO good!! It was actually pretty easy for a weeknight as well. I served it over sweet potatoes because that's all I had on hand. It was amazing!! This is something I'd totally serve to company. This is amazing, definitely a keeper. I just didn't cover the chicken in the oven. This was absolutely delicious & all my family loved it so needless to say it will definitely become a favorite. The only downfall I had was with the gravy, it split....twice! Both times after I added the milk, even though I added it slowly as per recipe. I remade my own version of gravy with less butter and still tasted yummy. I love your recipes.... but I wonder if you may add the calories per portion or in total. would this pair well with pasta? It really looks delicious. I can not wait to serve it. This chicken is delicious. It will be added to our family favorites. Thanks for sharing. This dish was wonderful!! Pretty presentation, easy to prepare and oh so delicious!! Make this tonight. My husband loved it. Was easy to make and delicious. The only things I did different was I used chicken strips and baked uncovered. Thanks for a recipe I'll make again. Have you ever made this and places it in the fridge or freezer for weekly meals? Any recommendations for breaking this recipe down for 2 servings? This was a delicious meal. Both the chicken and the gravy were great. I will be making this again. I just finished making and eating this dish for me and 2 very picky eaters (like EXTREMELY picky) and it's absolutely amazing! They gobbled it up and asked it there was leftovers for lunch tomorrow! I only didn't add the garlic salt because I didn't have any but other than that, I followed this recipe exactly. I served it with mashed red potatoes and this will now be a regular dish in my household. Thanks for sharing this great recipe! You haven't still not answered what you mean EXACTLY by "flour mixture" which is not just flour... can you buy this on the market? what kind of spices should we add to the normal flour? SO sorry for any confusion. So early in the recipe it states to add flour, paprika, salt, pepper, cayenne pepper, garlic powder, garlic salt, and onion powder in a large bowl and mix well. After you have dredged the chicken it states to save 1/2 cup to use for gravy later on in the recipe :) I updated it in that instruction to hopefully clarify any confusion. Please let me know if you still have questions.